SISBIYOTEK laboratories is equipped with genotyping and SNP analysis infrastructure. A laboratory room designed only for DNA isolation and a biosafety cabined allocated only for PCR reactions minimized the risk of contamination. 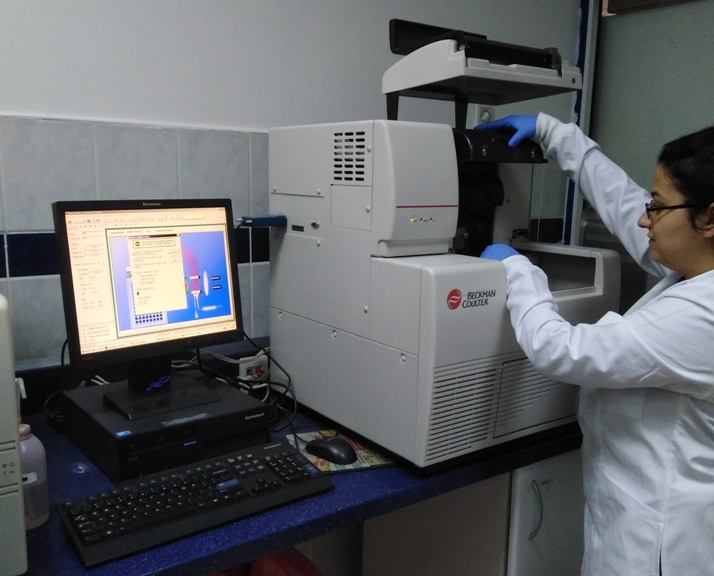 At SISBIYOTEK DNA sequence and fragment analyses are performed with Beckman CEQ 8000 and CEQ 8800 automated genetic analyzers. For the identification or confirmation of DNA sequence information of plasmid, phage, cosmid, bac or PCR products you should supply the template DNA at required concentration and quality as well as the appropriate primer. a. What should you supply to SISBIYOTEK? *Minimum 10 ul template DNA should be supplied. ** Minimum 10 ul primer (10pmol/ml) should be supplied along with template DNA. *** PCR purification should be performed on Qiagen/Qiaquick, Promega/Wizard, MN or with an equivalent system. For PCR products less than 200 bp Exonuclease1/SAP treatment should be preferred for purification. *****Primers should be HPLC (or OPC/Metabion or HPSF/MWG) purified. In order to get clear sequencing data the sequencing primer’s GC content, primer-dimer formation, hairpin formation criteria should be carefully considered. Applications can be made to our unit for further information on primer design. b. Information which should be submitted along with the samples. 1. The gel image of PCR products on 2% agarose and plasmid, phage, cosmid and bac DNA on 1% agarose should be included to DNA sequence analysis order form. Spectrophotometric measurements of plasmid, phage, cosmid and bac DNA (concentration, A260/A280 and A260/A230 ratios) should be stated in the order form that will be submitted to our unit along with DNA sample and primer. 2. The GC content of the region that will be sequenced should be included in the form to allow to optimize sequencing reactions. The sequence information of the sequence primer should also be added to the order form for our unit to check the conformity of the primer for sequencing reaction. The results will be delivered to the customer via email or post (hard or digital copy on CD) in a week depending to sample number. Genotyping based on Microsatellite (STR, SSR), AFLP, RFLP analysis is performed with WellRed dye labelled PCR products on Beckman CEQ8000/8800 Genetic Analyzer. Automatic allele identification with a resolution of + 1 base at 400 bases and + 2 bases at 600 bases. *WellRed labelled primers can be ordered from Proligo (www.proligo.com) or Invitrogen (www.invitrogen.com). b. Information that should be submitted along with the samples. 1. The gel image of PCR products on 2% agarose should be included in the order form. 2. The size of the PCR products to be analyzed. 3. All informations concerning samples submitted to our unit will be processed according to confidentiality rules. 4. Any order with missing information or samples and primer that do not comply with the quality and quantity standards will not be processed. The results will be delivered to the customer via email or post (hard or digital copy on CD) in a week (in the case of germ identification or “tescil tasdiki” between two to four weeks) depending to sample number.